Scientists believe they have determined the most precise date yet for the extinction of dinosaurs. 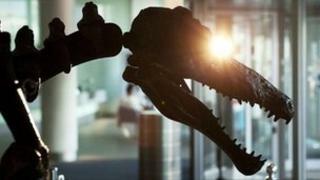 Researchers from Glasgow University were part of an international team that has been investigating the demise of the dinosaur. By using dating techniques on rock and ash samples, they established the creatures died out about 66,038,000 years ago - give or take 11,000 years. That date appears to coincide with the impact of a comet or asteroid. Debate has raged as to whether the giant impact was the sole cause of a quick demise of the dinosaurs, whether they were already in decline at the time of the impact, or whether the impact in fact happened as much as 300,000 years after they were gone. The study has been published in the journal Science, and also involved researchers from the Berkeley Geochronology Center and University of California, Berkeley in the US and Vrije University Amsterdam in the Netherlands. The extinction of the dinosaurs was first linked to a comet or asteroid impact in 1980. A 180km (110mi)-wide crater in the Caribbean off the Yucatan coast of Mexico is presumed to be the result of that impact. Called Chicxulub, the crater is thought to have been created by an object 10km (6mi) across that threw into the atmosphere debris which is still found around the globe. These include signs of the enormous force of impact and its extraterrestrial origin: glassy spheres known as tektites, "shocked" quartz and a layer of dust enriched with an element called iridium. The international team decided last year to use these clues to put a more precise date on the dinosaur extinction, by examining layers of the geological record where they lie close to the last fossils of dinosaurs. They looked at tektites from Haiti and volcanic ash collected from the Hell Creek Formation in Montana - the source of many dinosaur fossils and one of the best sites to study the change in fossils from before and after the extinction. The samples were analysed in laboratories first in the US, where a technique called "argon-argon dating" was used to determine their ages precisely. The approach makes use of a naturally radioactive isotope of potassium which decays into argon. It is among the most precise ways of "clocking" how long a particular sample has been decaying. Paul Renne, professor in residence of earth and planetary science at the University of California, said of the revised date: "The impact was clearly the final straw that provided the tipping point. "We have shown that these events are synchronous to within a gnat's eyebrow and therefore the impact clearly played a major role in extinctions, but it probably wasn't just the impact." The Glasgow researchers, based at the Scottish Universities Environmental Research Centre in East Kilbride and led by Dr Darren Mark, then conducted independent argon-argon analyses on rock samples, which confirmed the results from the US. Dr Mark said: "This study shows the power of high precision geochronology. "Many people think precision is just about adding another decimal place to a number, but it's far more exciting than that. It's more like getting a sharper lens on a camera. "It allows us to dissect the geological record at greater resolution and piece together the sequence of Earth history."